Buying property in New York can be an overwhelming process. Our job at GPMG is to help you make a thorough decision. We’ve put together a guide to inform and help you navigate your way through New York’s real estate buyer’s market. Location, size, amenities, building type, school locations and nearness to public transportation are crucial to determining what a property will cost. We suggest that buyers review financing options to determine what amount of money they can put toward a deposit and then determine what they can afford a monthly mortgage payment. Some people may want to see if they pre-qualify for mortgage status in order to know what budget they will be working within. The next thing to determine would be the type of property you’d like to buy. Would you like an apartment, condominium, co-op or commercial property? For apartment purchases, there is no approval process, besides normal financial inquiries. Buyers are entitled to have complete control over any renovations they wish to make. Maintenance costs are the sole responsibility an owner and with this, the owner gets total control over maintenance and repairs. Transferring deeds or reselling an apartment do not require approval. The size of a property can vary according to a budget and location of the property. Condo owners buy the apartment and also own a percentage of the common building areas, i.e. entrance areas, hallways and recreational areas etc. The condominium is considered real property; because of this fact, owner’s have the right to do use the property any way he/she sees fit. Owners are subject to pay property taxes which can either be escrowed into a part of a monthly mortgage payment or which are paid annually as an expense. Monthly maintenance fees are generally paid to the building’s condominium association. Buying a coop is tricky, but GPMG’s team of qualified agents can help. When purchasing a cooperative apartment the purchaser is really purchasing shares in a cooperation. The shares correspond to the units in which you live. Co-op fees include a monthly mortgage payment and maintenance fees for the building. Maintenance fees are sometimes high but both mortgage payments and maintenance fees generally result in higher tax deductibles. A board of directors, elected by the tenant owners of the co-op will interview prospective owners and will “approve” or “reject” a candidate based on their specific interests and guidelines. The amount of money that may be financed varies from one cooperative to the next. Some cooperatives will require substantial down payments of around 20 to 50% of the purchase price of the apartment. The Board of Directors must approve sub leasing a co-op. Each corporation has its own rules and they should be reviewed if the potential owner wants to sublet. One of the advantages of a co-op are the tax deductions for things such as monthly maintenance, real estate taxes, and portions shares of interest on the building’s mortgage. An approval process is usually required and will include an application package with financial disclosure, but the overall requirements are not as rigorous as co-op boards. That said, a board meeting may be required to be approved. The approval process length in time can vary, but it is usually not as long as co-op approval processes. The market, not a board of directors, governs financing a condominium purchase, so it is usually more flexible. Generally, a buyer can finance up to 90% of the purchase price. Sub-leasing is more flexible in a condominium, so they are often the better choice for an investment property. Condos are usually the ideal choice for a non-U.S. citizen or for those with assets held outside of the U.S. Most co-ops will not approve a candidate whose funds are not in the U.S.
Offers are made orally in New York City. Your bid will be placed through your agent to either the seller or the seller’s agent. The seller may counter the offer. Negotiations can include the price point, terms, and closing date. A real estate attorney is required in all property transactions in New York City. Your GPMG agent can assist you in finding an attorney with experience in Manhattan real estate. The seller’s attorney will be in preparation of the contract of sale, and during that time, your attorney will examine the financial condition of the building in question. After your attorney concludes that the financial condition is satisfactory and that the by-laws of the building are acceptable to you, you will sign the contract. At that time, you will pay a deposit, usually 10% of the purchase price. The contract and the deposit will then be forwarded to the seller for signature. The money will be held in the seller’s attorney’s escrow account until closing. It is important to note that until all parties have signed the contract and it has been delivered, the seller can still entertain and accept other offers. If financing, you should move forward with your loan application. Your GPMG agent can connect you with a mortgage broker. Pre-qualification for a mortgage is recommended prior to beginning your housing search. (should this go earlier? You will receive the board requirements and application materials from your GPMG agent. The documents are similar for either a condominium or cooperative, but the review process is very different. You will need to complete all required materials which often includes an application, a financial statement signed by a CPA, support for your financial statement, three years of tax returns, bank statements, letters of personal, professional, and financial reference, the contract of sale, and bank documents if you are financing, indicating that the loan is adequate and in place. When your package is complete, it will be forwarded to the agent for review. When it is determined to be in order, it will be sent to the Board of Directors for review. Incomplete applications cannot be processed. In the case of a cooperative, if your application receives initial approval, the Board or an interviewing committee will interview you. In the case of a condominium, your application is reviewed and if it meets all requirements, it is usually approved. There is usually no need for an interview in this process. 8. After approval from the Board, you are ready to close! Occasionally, borrowers are required to pay additional fees. These fees include Wire fees, Tax Service, Survey Costs, Flood Certification, Settlement Charges, Messenger Fees, Sub-Escrow Fees, and Transfer Tax. 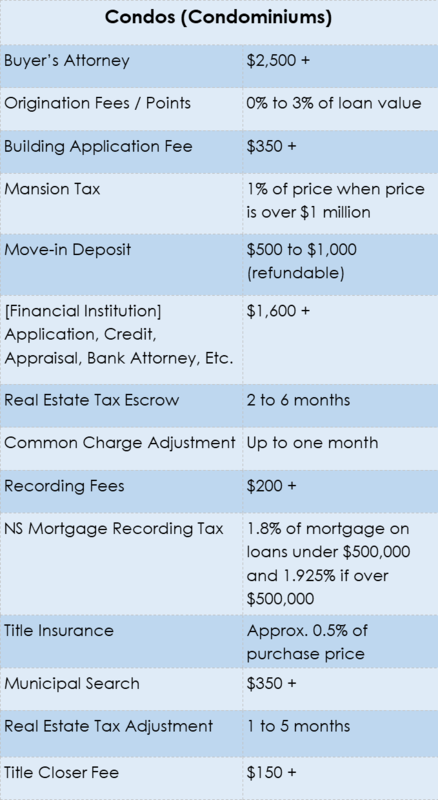 If you have any questions about these fees, do not hesitate to ask your broker. Pre-qualification is the first step you take to find out how much the bank will approve for the loan amount. Most banks can do this process over the phone: it’s that quick and easy! Pre-approval is a more involved step of purchasing. A lending institution will need to gather the financial information it requires to issue a loan. Your credit report will be checked. After an appointment and possibly a fee, the bank will let you know in writing how much money they will lend to you. Generally, yes. A mortgage broker will need to run a credit check in order to for a pre-approval to go through. Also as part of the approval process for a board or co-op a credit check is required. It is a good idea to have any disputed claims removed from your credit report before the credit check and keep all documentation pertaining to the issue and its resolution. After an offer is accepted, it generally takes 3 months to close. A good timeline for buyers is to start viewing 6 months before your desired move date. Unlike a general Google search, a buyer’s agent is dedicated to your needs. What is great about having an agent during the buying process is having someone as your point of contact throughout the entire process. GPMG agents provide a more personalized experience along with more in-depth market information, making the most important financial and emotional decision you will make as stress-free as possible. How do I win over a seller? The best way to win over a seller is to demonstrate you are a qualified buyer. This means having a complete financial statement is very important when there is an apartment or property with multiple bids. Financial statements should be prepared by an accountant and includes net worth, assets, liabilities, salary, and bonuses. A co-op board or condo association will want to make sure a buyer has enough assets that guarantees the mandatory maintenance fees in case of loss of income. For specific requirements, it’s best to consult your GPMG agent. What are the requirements for a co-op? 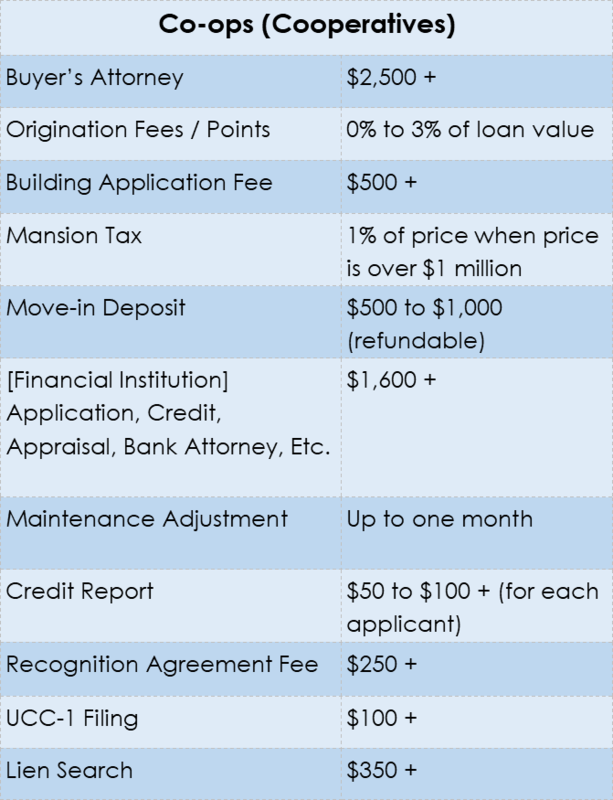 Although every co-op board is unique, the usual requests are: financial and employment history, a credit report, personal and professional references, list of occupants (including any pets) and the purchase price. An in-person interview could also be required. Purchasing a property is a legal transaction with title and tax implications. We recommend you hire an attorney, preferably one that specializes in real estate transactions. A mansion tax is a 1% tax on the sale of homes $1,000,000 or more. This tax is normally paid by the buyer within 15 days of closing. How do you put together a board package? A board package is a significant package submitted as the application for a purchase. After your offer is accepted and the purchase and sale agreements are signed, this package is submitted to the building’s managing agent for approval. Each board can require different/additional items. Your agent will be able to help you complete this package before it’s submitted. Closing costs are the expenses over and above the price of the property. When a deal has come to closing, it means the time in which a buyer gives a seller money in exchange for ownership and title to a particular property. This occurs after a mortgage is secured, and a board package has been approved. At closing, all parties involved in the sell should be present. This includes: seller, buyer, bank attorney, real estate brokers, buyer and seller’s attorneys, and title closer.